Summer time brings brighter days and warmer nights, which often means more time spent relaxing with friends and families, hosting barbecues and having pool parties while enjoying the serene weather conditions. Depending on the amount of cushions you’re covering, you’ll want to have enough fabric to cover the size of the cushions with 3 inches left to wrap around the back of the cushion. You can trace the circle marking where you’ll cut directly on the fabric by using a fabric marker. Once the circles are cut, you can serge the edge of the fabric to give it a nice finish. If you don’t have a serger machine you could use a zig zag stitch with your regular sewing machine. Now take elastic and line it up with your serged or zig-zagged edge, then pull the elastic very taut so there is no slack. Slowly sew the elastic and fabric together, making sure the elastic stays in place. Once you’ve finished sewing elastic onto the entire circle the edge of the fabric should pucker. If you’re not adding buttons, your cushions are now complete! To add buttons, take your button cover kit and cover the metal buttons with scraps left from your new fabric. Once they’re all covered, you can hand sew them to the cushions in any pattern you desire. 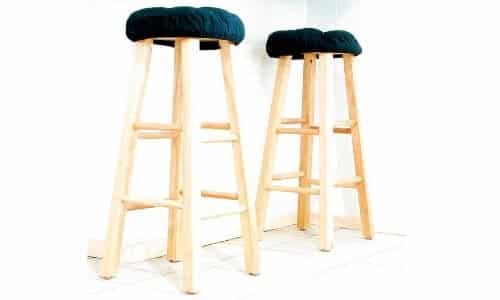 Now that the bar stools have been revived, isn’t it time to revive yourself with a cold drink at your bar?